OSHA Approved spiral stair: OSHA requirements on spiral stairs are less stringent than residential codes. 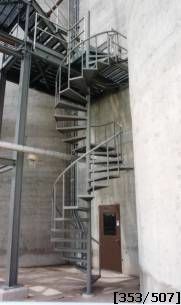 The spiral stair shown here is a good example of OSHA requirements. This application is at a waste water treatment plant. The stair is for maintenance access; therefore, no children will be using the spiral stair. An adult using this spiral stair will be taller than the handrail height so there is no need for tight baluster spacing. At a point less than 12’ in elevation, this spiral stair has a rest landing which is also an OSHA requirement. The handrail height, headroom, riser height and distance between the center column and handrail will pass OSHA standards. A spiral stair with these requirements that is shipped in one section will be an inexpensive, easy-to-ship, install.